These carabiner style lighter leashes hold any standard size lighter with a small metal carabiner to attach your lighter to just about anything. 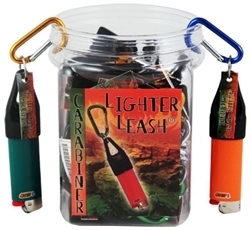 This particular lighter leash is different than the other styles because it does not have a retractable line, so the lighter and carabiner will have to stay close together. The Carabiner lighter leash would be great to used on a keychain to keep a lighter close to your belongings. Each store fishbowl counter display contains 30 lighter leashes in 5 different colors.